The late Biaggio Signorelli, Founder of Doltone House Group, was inducted into the Multicultural Honour Roll at the Premier’s Harmony Dinner on Wednesday 21st March, 2018. Biaggio arrived in Sydney in 1954 with nothing more than a suitcase, as a 19-year-old migrant from the small Sicilian town of Poggioreale. He couldn’t have dreamed of the incredible Sydney hospitality legacy he would leave his children and grandchildren. Over the years Biaggio supported many migrant’s integration into Australian society as well as supporting them and their families’ wellbeing, social inclusions, harmony and services. During his career Biaggio donated funds to many Italian associations in Sydney. Biaggio was no stranger to hard work. He began his career as a greengrocer in Willoughby and took on a second job in a factory – a workplace that exposed him to asbestos which inevitably cost him his life. To Biaggio, there was nothing more important than family. He cherished his wife of over 40 years Fina and his children; Paul, Nina and Anna. The family always worked together – in life and in business. Biaggio established the Doltone House Group in 1995 and his family has continued to build upon his legacy since he passed away. 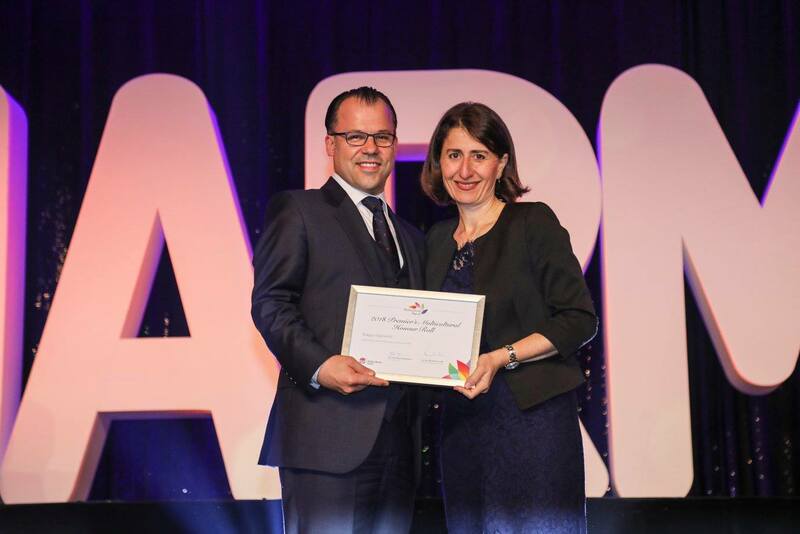 Biaggio was represented by his family, as he was inducted into the Multicultural Honour Roll by NSW Premier, the Hon Gladys Berejiklian MP. “Not a day goes by that we don’t remember my father and look back on his legacy with great pride,” Paul said. Biaggio passed away from Mesothelioma (Asbestos Cancer) in 2008, a highly aggressive cancer caused by asbestos exposure. Biaggio’s final words to his son Paul were “grow the business, look after your family and help to save others”. In 2009 Biaggio was posthumously named Italo-Australian of The Year by the Italian National Day Committee and in 2012 the NSW Parliament’s Legislative Council voted unanimously to acknowledge and honour the outstanding work of Biaggio and the legacy that continues with the Biaggio Signorelli Asbestos Foundation. In 2010 a Bronze life size statue titled ‘Life from a Suitcase ‘was unveiled by the then Governor of NSW Dame Marie Bashir in his honour at Jones Bay Wharf, the very place he first stepped foot on as a migrant to our great nation. To honour Biaggio’s wishes, the Signorelli family established the Biaggio Signorelli Asbestos Foundation, which is dedicated to asbestos awareness, early detection and ultimately helping to find a cure for Mesothelioma. The Premier’s Harmony Dinner recognises and celebrates the significant contributions made by multicultural leaders and community groups. Those inducted into the Honour Roll are recognised for helping to build the successful multicultural society we enjoy today.